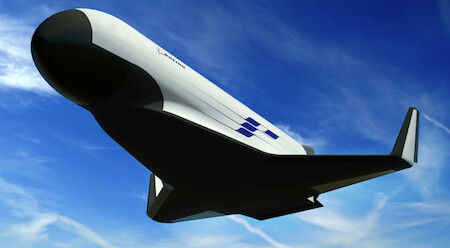 The XS-1 Spaceplane is a DARPA project to deliver cargo from Earth's surface to low earth orbit for low, low prices. In an era of declining budgets and proliferating foreign threats to U.S. air and space assets, routine, affordable and responsive access to space is essential to enabling new military space capabilities and rapid reconstitution of space systems during crisis. The objective of the Experimental Spaceplane XS-1 program is to demonstrate the technology needed to fabricate and fly a reusable aircraft to the edge of space. The XS-1 will be capable of deploying a small expendable upper stage to launch a 3,000-pound spacecraft to earth orbit at a cost of $5M, ten times less than today’s launch systems. A key program objective is to fly 10 times in 10 days to demonstrate “aircraft-like” operability, cost efficiency and reliability. Key anticipated characteristics of the XS-1 aircraft include a physical size and dry weight typical of today’s business jets. A shuttle ship up from the surface could leave any spot on Venus, rendezvous with the ship in orbit, then land on its port of departure or on any other point having expended a theoretical minimum of fuel. As soon as the Nautilus had parked, such shuttles began to swarm up to her. They were more airplane than spaceship, for, although each was sealed and pressurized to operate outside the atmosphere while making contact with orbiting spaceships, each was winged and was powered with ramjet atmosphere engines as well as with rocket jets. Like frogs, they were adapted to two media. Update 08-Jun-2016: Take a look at this entry, the first use of the phrase "space shuttle", in Hell Ship of Space (1940) by Frederic Arnold Kummer, Jr.. End update.